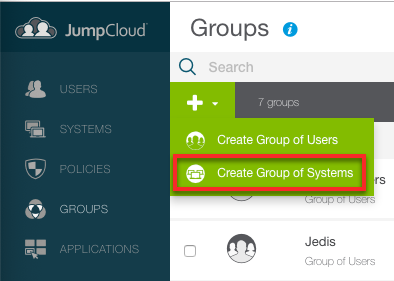 JumpCloud® user and system groups let you perform group-based assignments on resources. User groups grant users access to resources. System groups pool together your systems for policy enforcement and user account provisioning at scale. For user groups, connect the distinct resources you want to let users access (applications, LDAP resources, networks and more). 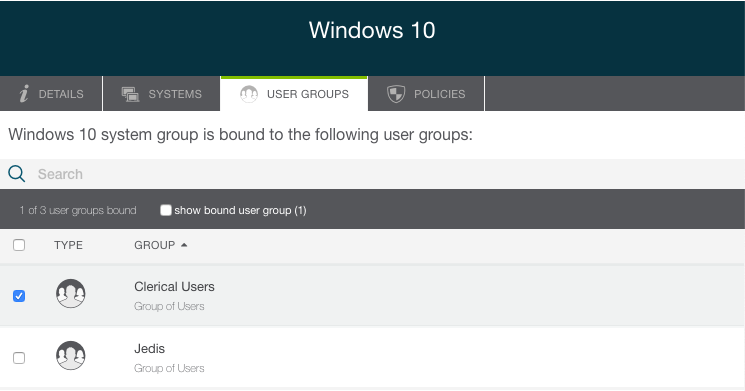 For system groups, connect the user groups you want to provide bulk-access to, and assign system policies en masse. To create a group of users, individual users should be created first, see Getting Started: Users. Log in to the JumpCloud Admin Portal: https://console.jumpcloud.com/login. Click ( + ), then select Create Group of Users. The New User Group panel appears. Group Name: This is an arbitrary descriptive value for the group's purpose. Create Linux group for this user group: (Optional) If enabled, Linux® group name and Group GID must be defined. Members of this group will be added to new or existing Linux groups on supported OS's. If the group is bound to LDAP, it will be added to the posixGroup objectClass. Note: Linux group name currently doesn't support hyphens. Next, add users to the group. On the New User Group panel, click the Users tab. Select users in the list. A Group of Systems - Connecting a group of users to a group of systems will also be reflected in the Groups panel Users tab. It's important to determine a connection scheme according to the access needs of your organization. It may be best to create a group to connect to a single type of resource. For example, a group of developers that are bound to system group that contains production infrastructure. If the use case requires that a specific user group should also have unique access to another resource such as a RADIUS-enabled WAP, then it can make sense to connect the user group to multiple resource types, but doing so could limit the amount of control in the future if access needs to be segregated; removing or adding users to the group would grant or revoke access to all of the resources the group is bound to. Select a group of users from the list of groups. On the user panel, click the tab that corresponds to the type of resource you want to connect to the user group. You can select System Groups, Applications, RADIUS, or Directories. Select the resources you want to connect to the user group, then click save group. To create a group of systems, systems should be added first, see Getting Started: Systems. Click ( + ), then select Create Group of Systems. The New System Group panel appears. Next, define the systems that should belong to the group. 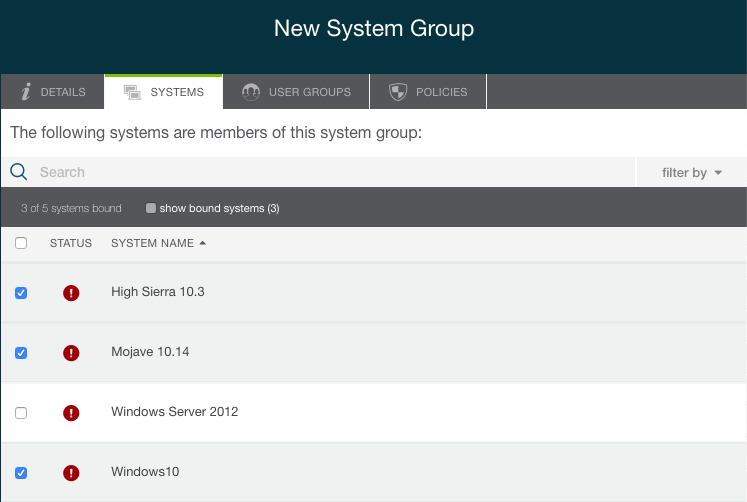 On the New User Group panel, click the Systems tab. Select systems in the list. After you define the group systems, you can connect the group to one or more user groups. As previously described, access to all resources is implicitly denied by default. To grant access, groups must be explicitly bound to resources. 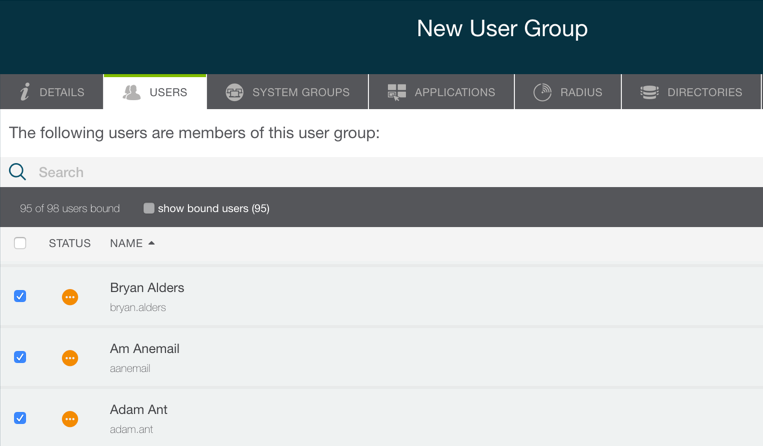 On the New User Group panel, click the User Groups tab. Select one or more user groups in the list. 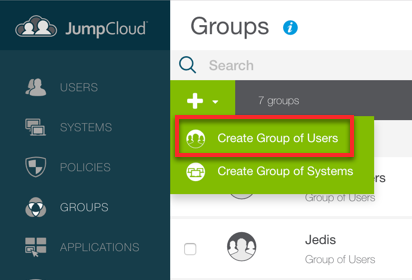 Find more information about groups in the JumpCloud KB's User and Group Management section and by watching the following video.